I would suggest you measure a few other bases. As I make (made) my own movement trays, I measured a lot of different bases. It is rare to find ones that are exactly correct in terms of size. I don't buy the arguement that base size should be the arbiter of number of attacks or whatever. So many people (used to) play on custom movement trays that it was always more efficient to do the math in your head. Also at a difference of approx. 1 mm you need a significantly sized unit before you even notice the problem - far wider than is typical in WFB. Maybe in general they found people order less square bases than they used to after GW decision to kill WHFB and start AoS? MicroArt produces bases with different systems in mind and that is what they chose to do. 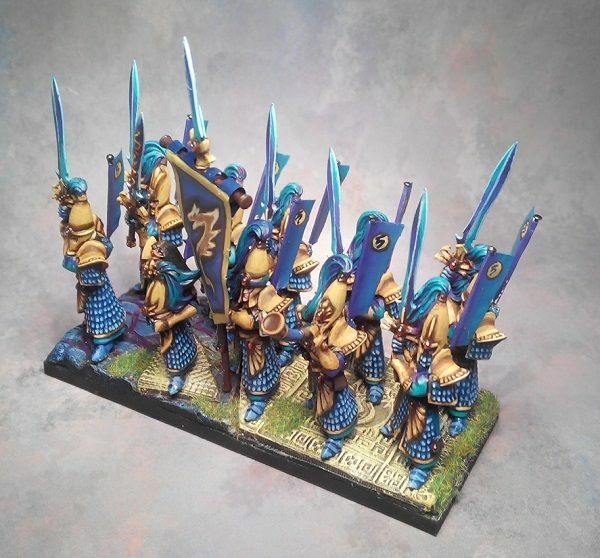 Maybe in time, if KoW gains in popularity in Europe, they may come back to square bases or start releasing new products for so called multi-basing. I did, they are consistent in the dimensions they have. That is why I contacted the producer and why I took their offer to send the items back and get the refund. 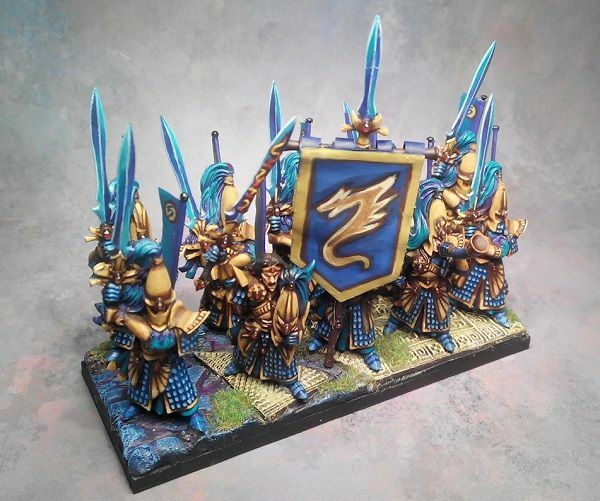 I also don't play WHFB anymore so it is not an issue of how many models are in base touch but what is the total size of the unit's base for Kings of War. Almost half a cm for an infantry regiment less is already a significant difference for the purpose of measuring the arc of visibility and determining if the unit can be seen or not/where is its flank or rear etc. As you can see from the pictures, it is even worse for the cavalry bases and the 50 x 50mm bases (not shown) that are used for large cavalry in my army. Also, it is going to be a more significant difference for a horde type of an infantry unit that is 10 models wide. Even if I don't use such units in my army it would be a problem for somebody who does. I decided to send them back because I would not be able to buy enough of the bases in the future to make the consistent look for the army with any unit I will add to the collection. Having said that I really want to emphasize that the customer service was excellent and they really put a lot of effort in providing an explanation as well as solution to the problem I encountered. I greatly appreciate that and if it was not for the fact they are going to discontinue their square bases I would probably try to come up with a modelling solution to the issue. The conversions in particular, inspired. Really nice work. You've made all the different parts fit like a glove. I can also appreciate the work put into sculpting all that scale armour. And brilliant painting. I can sympathise with the base problem too. I've done a bit of hmming and haaing over base sizes for different games - including KoW. Great use of Cold Ones and a great job overall! Thanks for all the kind words! I am glad you like the Drakon Riders. More pictures can be seen in the battle reports from the games (check the blog). Congrats on getting in to the golden D6 magazine. They really deserve it. Thanks! I got my first article about a battle report there some time ago but it was even more rewarding to get the one about modelling/painting project! 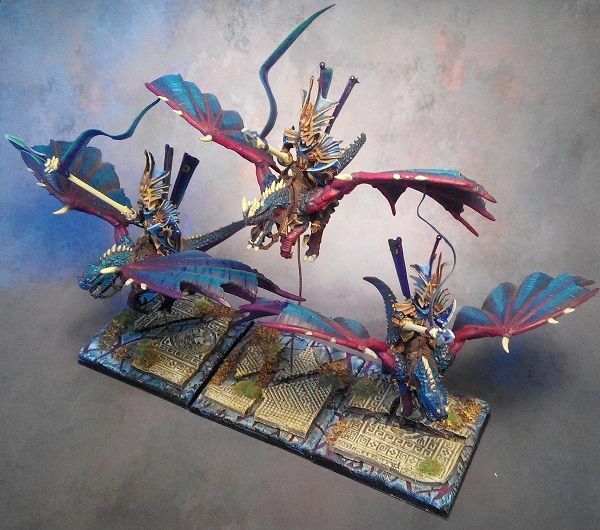 Those Drakon Riders are just superb - top notch modelling and painting! 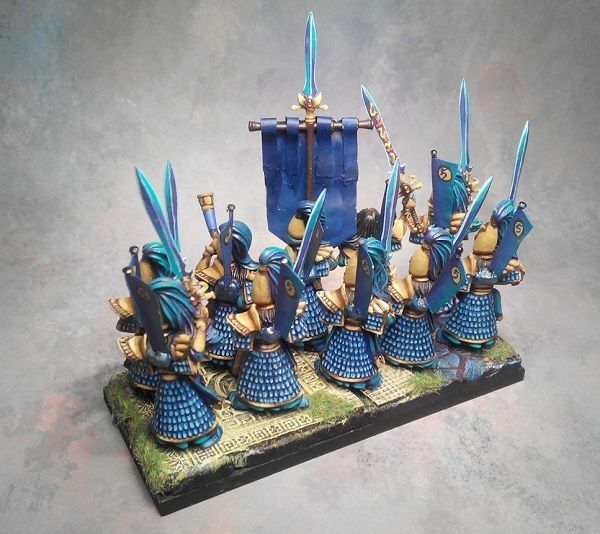 Here are the pictures of my Swordmasters as a troop type of a unit for Palace Guard in Kings of War. Entire unit is multibased (i.e. each model is fixed to the unit base and cannot be removed) and the base itself is magnetized. I will replace the banner as I am not happy with it but as I plan to do it once I finish second unit of the same it will stay until then. Nice as always, that ivory armour still looks good! The banner design could indeed use some improvement. Looks great A bit more subdued then some of your older units, which are more gold then ivory. I like it. And great basing. The fact that it's one big base adds some great options for doing a nice, elaborate base. Really nice SM. Attention to detail and the sashimono show the level of care here. Personally, I like the banner. love your colours SM. It had been a while you didnt post here, did you? Thanks a lot for the comments, I am glad you like the new unit. I definitely rushed the banner. I need a better design or example to look at. Then I can try to copy that on the banner. Once the second unit is done I will replace this banner. I need to take a group photo because I am using the same colors so I guess it must be the light that creates more ivory look. The base is a great thing to make, especially with rolling pins from GreenStuff World. Easy to make but create much nicer effect, even for a small troop. Thanks! I was not sure about the back banners but I am glad I added them. It will help to tie units in the army together. Not all of them will have it but I will try to do it for as many as possible. Thanks! Indeed, I don't visit the forum that often these days. But hopefully I will be able to provide some updates soon. Here is a quick photo of two units with twin banners. I borrowed the symbol from Eldar codex. I will take better photos at some stage but this is what I have for now, before the local tournament on Saturday. Good luck on the tourney, i have you have some fun battles and dont have to deal with too much cheese! 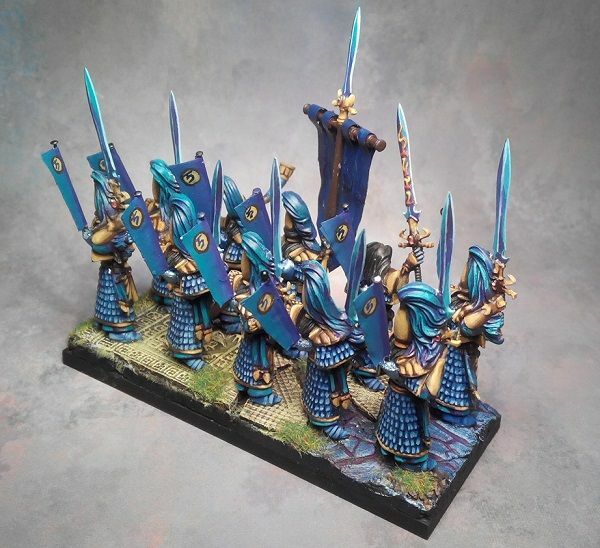 Really nice work mate, the Swordmasters in particular Look amazing! Btw, here is the link to the introduction to the battle reports if you are interested. It was a great event and I am glad I managed to attend after such a long break. Now I need to figure out how to find time for battle reports, weekly games for the campaign and to continue painting - this time moving on to another unit. The swordmasters look great. I especially like the banners. Nothing over the top. But good painting and something you can see a real unit using.